You can reformat your graph’s axes, using the X-Y Axes page of the Formatting Currently Selected X-Y Plot dialog box. • Double-click in the graph. Alternatively, choose Graph=:}X-Y Plot from the Format menu. You’ll see the dialog box for formatting X-Y plots. • If necessary, click the X-Y Axes tab to display the X-Y Axes page, shown below. 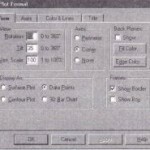 • There is a complete group of settings for each axis. Change the appropriate settings. • Click “OK” to accept your changes and close the dialog box. Mathcad redraws the graph with the new settings in effect. Alternatively, click “Apply” to see the graph redrawn without closing the dialog box. Click “Close” to close the dialog box. The rest of this section describes the settings on the X-Y Axes page of the dialog box for formatting X-Y Plots. It then provides detailed discussions about options for setting axis limits and for adding horizontal and vertical reference lines to your graph. When this box is checked, the tick marks on the selected axis are replaced by grid lines. The top-right-hand graph in Figure 20-16 on page 489 illustrates a graph that uses grid lines rather than tick marks. This controls axis limits that you don’t otherwise specify. When this box is checked, Mathcad rounds the axis limit to the next major tick mark. When unchecked, Mathcad sets the axis limit to the data limit. For a discussion of Autoscale and the other ways to set axis limits, see “Setting limits for axes” later in this section. When this box is checked, you can add reference lines to your graph. For a discussion of Show Markers and another way to create horizontal and vertical reference lines, see “Adding horizontal and vertical lines” later in this section. When this box is checked, Mathcad automatically selects the number of grid intervals created by tick marks or grid lines on the axes. When the box is unchecked, you choose the number of grid intervals by typing in the box labeled “No. of Grids”. Enter a number from 2 to 99. You can specify the number of grid intervals only when Log Scale is unchecked. Figure 20-21 on page 491 illustrates the effect of Auto Grid. These buttons define the style in which the graph will show the axes. Boxed axes are crossed in the bottom left comer of the graph. Crossed axes are crossed in the center of the graph. 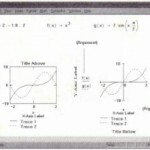 If you select None, no axes will be displayed on the graph. Figure 20-22 on page 492 illustrates the use of crossed axes. If you choose Equal Scale, both axes will use the same limits. • Automatically, with Autoscale turned on. • Automatically, with Autoscale turned off. • Manually, by entering the limits directly on the graph. graphed. 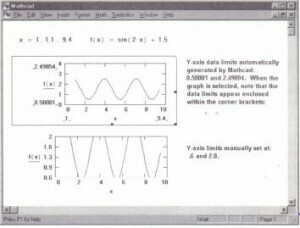 With Autoscale off, Mathcad automatically sets the axis limits exactly at the data limits. 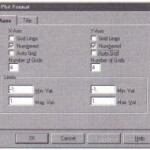 • Click on Autoscale for the appropriate axis to remove the check and to toggle Autoscale off. • Click the graph to select it. 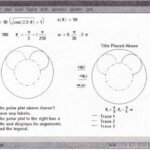 Mathcad displays four additional numbers, one by each axis limit. These numbers are enclosed within corner symbols, as illustrated in the selected plot in Figure 20-11. • To set the axis limit on the horizontal axis, click on the number underneath the appropriate x-axis limit and type the number at which you want the axis to end. To set an axis limit for the vertical axis, do the same thing to the number to the left of the appropriate y-axis limit. • Click outside the graph. Mathcad redraws it using the axis limits you specified. The corner symbols below the limits you changed will disappear. 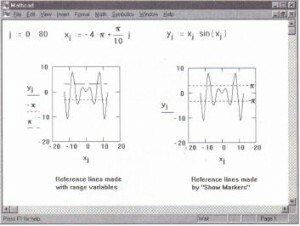 Figure 20-11 shows the effect of manually setting limits on a graph. Data Limits set manually and automaticaLLy. • Click in the plot to select it. • Choose Graph-eX-Y Plot from the Format menu or double-click on the graph to bring up the dialog box for formatting X-V graphs. 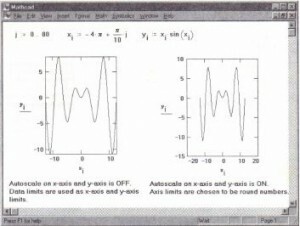 • If necessary, click on the X-Y Axes tab to display the X-Y Axes page, as shown on page 472. • For a vertical line, click on Show Markers in the X-axis column to add a check; for a horizontal line, click on Show Markers in the Y-axis column to add a check. Click “OK”. Mathcad shows two additional placeholders on each axis for which you have Show Markers checked. • To create a horizontal line, place a range variable on the middle placeholder of the x-axis and the constant expression on the y-axis. Mathcad will plot a horizontal line across the plot at whatever value the constant value happens to be. The expression you place on the y-axis need not depend on the range variable you place on the xaxis.